The Hewitt girls look so similar! Bec Hewitt and her two daughters Mia Hewitt, 12, and Ava Hewitt, seven, enjoyed a girls' day out in Melbourne recently. And onlookers were quick to do a double take at the tight trio, who bear a seriously striking resemblance. 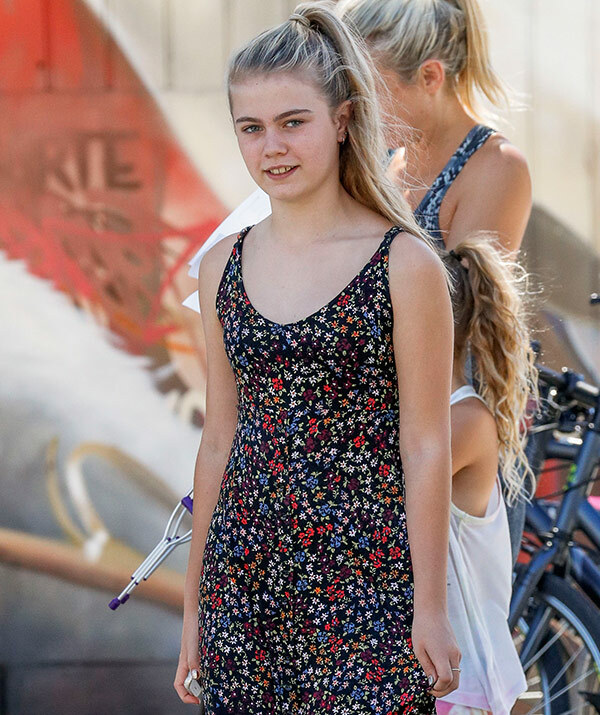 The sisters have inherited the former Home and Away star's long blonde locks, blue eyes and button nose. Bec, 34, kept things casual in a snake-print dress by Adidas and a pair of trainers. And while they may jet-set all over the world between their mansions, Bec proved she was still a down-to-earth Aussie mum as she held onto a bag of Uber Eats delivery food. (L-R) Mia, Bec and Ava enjoyed a family outing in Melbourne recently. Bec was pictured carrying a bag of delivery good from Uber Eats. It looks like Ava and her older sister Mia are set to follow in Bec's showbusiness footsteps with the girls trying their hand at some child modelling, too. In 2016, the star took her two daughters to a children's model casting and clothing fitting for the Virgin Australia Melbourne Fashion Festival. The girls had fans doing a double (or is that triple?) take! Proud dad and tennis star Lleyton Hewitt spoke to The Weekly about his love for spending time his children and their pup Bux. Last month, the Hewitt clan rallied around Lleyton as he played in the men's doubles at the Australian Open. "Honestly, the kids love the dog. We can go out walking for an hour and the time will just fly," he revealed. In January, Bec and the kids rallied around Lleyton as he made a surprise return out of retirement to play in the men's doubles at the Australian Open. Lleyton, who retired from the sport in 2016 but now heads up the Davis Cup, made it all the way to the quarter finals with his partner Sam Groth. And throughout it all Bec, Mia, Ava and Cruz were cheering him on from the crowd at every game. Mia, who is Bec and Lleyton's oldest, celebrated her 12th birthday in November.